The Hate Industry: children and adolescents in the Gaza Strip kiss the corpses of terrorist-operative martyrs (shaheeds). Three Arab residents of East Jerusalem were recently indicted for planning terrorist attacks for the Palestinian Islamic Jihad. Exploiting their freedom of movement in Israel, they were part of a plan to carry out a suicide bombing attack in Jerusalem. The Internet in the service of terrorist organizations: the Palestinian Islamic Jihad’s Internet network and the service providers by which the organization is supported (updated to September 18, 2007). 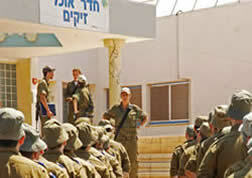 A rocket fired at the northern Negev on the night of September 10 hit the IDF base at Zikim, wounding 50 soldiers.